The design of sundials was a challenge to the imagination of instrument makers: chalice dials show great ingenuity, but only a few examples are known. This one has a base decorated with arabesques and three raised bosses, one of which opens to reveal a small compass (the present compass plate is a 19th-century replacement). 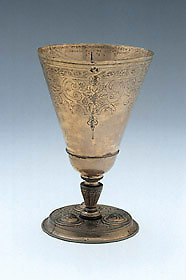 The external part of the cup is decorated with arabesques and foliage, and the hour lines are engraved on the inner part. The gnomon is in the centre of the cup. The dial marks Italian hours, whose lines are to be read with the empty cup. The other hour lines, for common hours, are meant to be read with the cup full of water, and they are designed taking into account the refractive index of the liquid.